SilcoTek CVD coatings are uniquely tailored to solve tough material problems in a variety of industries and applications. We offer over 20 custom coatings that solve challenging material problems found in process, analytical, semiconductor, gas, oil and wherever a durable inert surface is needed. We call our patented CVD coatings silcod technologies because they can be tailored to meet your specific application. To learn more about SilcoTek's intellectual property and how we improve performance, please visit www.silcotek.com/ip. Are there byproducts as a result of the SilcoTek coating process that I should be aware of? Will SilcoTek coatings adequately coat the inside of very small diameter channels and tubing? Are SilcoTek's coatings RoHS and REACH compliant? What about their MSDS sheets? Can SilcoTek coat assemblies like valves, regulators, and flow controllers? Do I need to pre-clean my parts prior to sending them to SilcoTek® for coating? Does SilcoTek offer FDA compliant coatings? Will SilcoTek coatings make my non-compliant parts compliant with NACE MRO175 / ISO 15156? How long will a SilcoTek coating last in my application? Where can I order parts already coated by SilcoTek? How can I receive pricing for custom surface treatment? How do I select the most appropriate treatment for my application? Why do Silco'd treated pieces have different colors? What are the temperature limits for SilcoTek treated surfaces? How thick are SilcoTek coatings? Will coating my parts affect their electrical conductivity? What is the maximum length of tubing you can coat? What are my options for coating tubing? Can I weld my parts after coating? Will brazing or soldering impact the quality of the coating? How tightly can the tubing be bent? Do SilcoTek coatings change the roughness of the surface? Can sealing surfaces be coated? What materials can be surface treated? What can you coat? Will you re-deactivate my SilcoNert® 2000 treated glass liners or SilcoNert® 1000 metal liners after I clean them? What is the maximum temperature limit for SilcoNert 2000 deactivated glass? Why is SilcoNert® 2000 on glass gold in color? Can SilcoTek® coat fritted liners? Can SilcoTek coat aluminum substrates? The United States Food and Drug administration (FDA) does not formally "approve" coatings or other materials for food or bio/pharmaceutical contact. Rather, the FDA regulates coatings via the Code of Federal Regulations (CFR), specifically 21 CFR 175.300 which lists what raw materials are acceptable and unacceptable for the formulation of coatings. It is then up to the coating supplier to self-regulate to ensure that they are using raw materials that are acceptable. According to the FDA, a coating must 1) pass the solvent extraction tests listed in 21 CFR 175.300, 2) contain no heavy metals, and 3) all coating components conform to the materials listed by the FDA in order to be compliant. Since these stipulations are also required for NSF/ANSI 51 certification and Dursan® successfully meets these requirements, our coating is FDA compliant. With respect to pharmaceutical applications, our data suggest that Dursan® does not "alter the safety, identity, strength, quality, or purity of the drug product beyond the official or other established requirements" per 21 CFR 211.65. Nevertheless, we strongly encourage customers to test the use of Dursan® in their specific application to verify that performance requirements are met and the customer's production processes and outputs can continue to meet FDA approval guidelines. A general-purpose passivation layer for steel and stainless steel. The ultimate passivation of treated surfaces, from glass to high nickel alloys of steel. A required treatment for metal components when analyzing for parts-per-billion levels of organo-sulfur compounds, mercury, and other reactive chemicals. A corrosion resistant layer that increases the lifetime of system components in acidic environments containing hydrochloric acid, nitric acid, or seawater. Also a tremendous oxidation-resistant barrier. Dramatically reduces carbon coke buildup on stainless steel components. Greatly reduces outgassing from components of ultra-high vacuum systems. Our most versatile coating. Ideal for corrosion resistance in pH 0-14 environments but also highly inert for low-level (ppm) sampling. Ideal for harsh processing or analytical environments, Dursan also offers 2x the wear resistance of bare 316 stainless steel. A ceramic-like silicon oxide (SiO) film. Ideal for protecting parts when the carbon content of Dursan is not desirable. What materials can be surface treated? Virtually all alloys of stainless steel, ceramic, and most glass materials can be treated. Some other metallic materials, such as nickel, brass, and copper, are incompatible with the 400+°C temperatures used in the process, and should not be treated. Note: carbon steel, F22 or similar carbon steel, is not recommended for coating in corrosion resistant applications. Treated carbon steel may rust in corrosive environments. Avoid corrosive environments when using treated carbon steel in inert sampling applications. SilcoTek can coat aluminum substrates however there are limitations for components used in high stress applications. 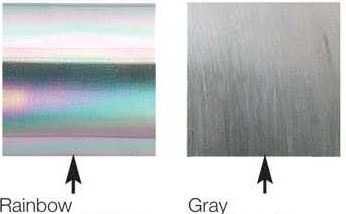 Go to our aluminum coating page to learn more about aluminum coating capabilities. Contact us to ensure optimal processing of your aluminum parts. Can sealing surfaces like CF, face seal, threaded and compression fittings be coated? Yes! SilcoTek coatings are proven to withstand compression and shear stress common to CF, face seal, and threaded sealing systems. For more information about SilcoTek coatings and sealing surfaces, click here! 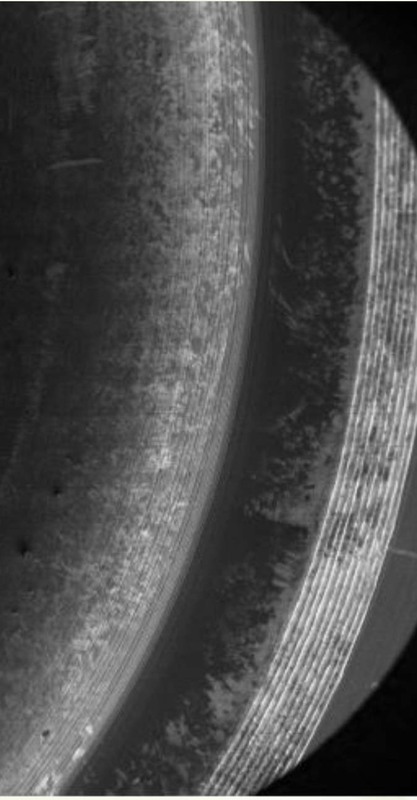 FESEM (Field Emission Scanning Electron Microscopy) image of the coated pre-sealed surface shows the coating conforms to the sealing area. The raised surfaces of the face seal gland area can be seen. SilcoTek coatings conform to surface contours and small orifices. 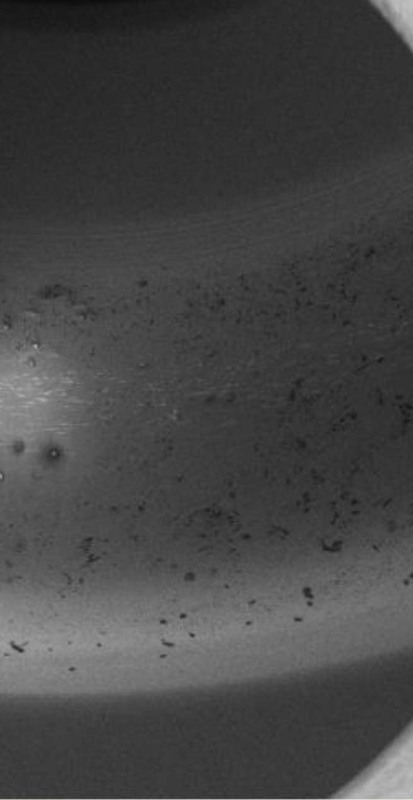 After making the metal-to-metal face seal per manufacturers instruction, a second FESEM image of the post sealing surface shows no scarring or scratching, only trace particulate from the silver gasket. No. Raw, uncoated parts must be specified such that the material meets NACE MRO175 / ISO 15156 standards when they are ordered from the manufacturer. Coating parts that are not already compliant with nace MRO175 / ISO 15156 will not make them compliant under any circumstances. However, if SilcoTek coats parts that are already compliant with NACE MR0175 / ISO 15156, then they will remain compliant after coating - we simply added onto the already-compliant material. SilcoTek does not recommend coating ferrules as we have found this may lead to leaking problems after coating. In general, temperatures should not exceed the recommendations below in order to maintain the coatings' specified performance properties, but coated parts can be used at higher temperatures under certain conditions. Heat treatment of parts at the application's temperature will ensure the best results if exceeding the temperature limits suggested below. Please contact technical support at 814-353-1778 or by clicking here for additional information or to discuss your application. *The values below reflect limits of the coating material itself and assume that the base substrate is stable at these temperatures. Click here to request a quotation for custom surface deactivation of sample pathway components, inlet liners, etc. Please forward a scaled drawing or photograph detailing the product to be treated. Upon receipt of this completed worksheet, SilcoTek's Technical Staff will contact you with a quotation, typically within 1 business day or less. When you are ready to send items to SilcoTek for treatment, contact technical support at 814-353-1778 or email SilcoD@SilcoTek.com to request a sales order number. When submitting parts for treatment, remember that parts must be completely dissembled, and components that cannot withstand the high (400°C) temperatures associated with the process (rubber o-rings, brass, etc.) must be removed. Note that SilcoTek cannot assume liability for damaged parts due to process heat. See your quote for specific disclaimers. How will SilcoTek surface treatments work in my acidic environment? SilcoNert 1000 and SilcoNert 2000 treated materials have improved corrosion resistance, but Silcolloy (formerly Silcosteel®-CR) and Dursan surface treatments are optimized to enhance resistance to many common acids; providing a 10-fold improvement in corrosion resistance, compared to untreated stainless steel, and a 4-fold improvement compared to SilcoNert 1000 coated stainless steel. SilcoNert2000 (U.S. patent 6,444,326) is a passivation process that applies an inert, integral layer to components used for chromatographic analysis. Unlike traditional deactivations, it is not susceptible to cleavage or formation of active silanols and, therefore, greatly reduces bleed, and breakdown or adsorption of active components, compared to conventional surface coatings. Welding will remove the SilcoTek coating ~2-4mm in all directions from the heat affected zone. SilcoTek can coat over high-quality welds, such as those listed in our material compatibility guide. For specific questions regarding welding, please call +1 (814) 353-1778 and press 2 for technical service. Yes, SilcoTek can coat most grades of aluminum alloys. It is important that customers inform SilcoTek of the exact material grade of aluminum substrates prior to sending parts. Learn more by clicking here. *SilcoTek does not recommend coating cylinders or any other aluminum product that will be pressurized or used in high stress applications. Why is SilcoNert 2000 on glass gold in color? The color of a surface coating is an expression of the light diffraction qualities and thickness of the layer. The thickness of a SilcoNert 2000 layer determines the degree of darkness, secondary reflectivity, and/or final color of the item. The color can range from light golden-brown (thin coatings) to reflective silver (heavier coatings). We deposit a layer that provides a gold color on liners to aid analysts in inspecting for cleanliness. Chromatographic performance does not depend on the thickness of the layer. There are several variables that determine thickness, but all SilcoTek coatings in current production are deposited at < 3µm thicknesses. Please contact us to discuss thickness specifications. Maximum temperatures usually will be dictated by the composition of the glass, not by the surface treatment. The SilcoNert 2000 layer is stable at temperatures up to 450°C, but some glasses can soften at lower temperatures. Injection port temperatures normally are well below the SilcoNert 2000 maximum temperature limit, so SilcoNert 2000 treatment is an excellent deactivation for all injection port surfaces. Does SilcoTek offer custom SilcoNert treatment? We are always interested in your specific surface passivation needs. Surface deactivation of glass or metal with a SilcoNert 2000 layer is available on a custom basis, and liner deactivation has become popular with some customers. Please keep in mind that treated surfaces must be able to withstand temperatures up to 450°C, as well as vacuum and pressure environments. It is important to remove any o-rings, seals, or other materials that will not withstand the treatment environment prior to sending items to SilcoTek for coating. Our SilcoTek Group can provide a quote. Please submit a quote or contact us at 814-353-1778. Why do Silco'd™ treated pieces have different colors? The different colors of the coating can be attributed to angstrom-level thickness variations across the surface. All SilcoTek coatings have a thickness of <1.5µm. Will you re-deactivate my SilcoNert 2000 treated glass liners or SilcoNert 1000 metal liners after I clean them? Request re-deactivation of SilcoNert 2000 treated glass liners by contacting SilcoTek's Customer Service department at 814-353-1778. Requesting SilcoNert 2000 re-deactivation of customer supplied liners. A minimum of ten liners is required. Metal inlet liners are designed as inexpensive, disposable products and it is not cost effective to re-treat them. We recommend discarding them when they are no longer serviceable. Absolutely! SilcoTek can coat the internal and external metal pathways for most flow regulating and metering devices to enhance their inertness and provide corrosion resistance. In order to coat the surfaces, all valves, regulators, and flow meters should be dissembled and all seals or parts which cannot be exposed to temperatures of approximately 400°C must be removed. Disassembly should only be performed by qualified personnel with the appropriate seal kits, tools, and training OR damage or failure to the device will occur. For these reasons, SilcoTek cannot take on the responsibility of disassembly or reassembly of any valve, regulator, or flow meter. If you do not have the experience and parts necessary to dissemble these devices, we recommend that you get in touch with Swagelok, Parker, or your valve manufacturer and order the coating treatment directly from them. SilcoTek has business relationships with most manufacturers and routinely coats the internal and external surfaces of valves, regulators, and flow meters for them. The manufacturer will send the parts prior to assembling to SilcoTek for coating and will assemble the parts at their factory under the guidance of their quality systems. Where can I order products that are already coated by SilcoTek? SilcoTek does not sell anything besides our coating services, but our Channel Partners work with us to stock their products with our coatings to help your supply chain. Click here to see product listings. Will brazing impact the quality of the coating? Click here to read a Technical Insight from SilcoTek's R&D group regarding coating of brazed and soldered components. 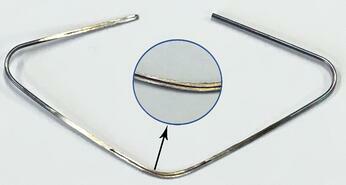 We recommend vacuum brazing or welding of joints for best coating quality. Vacuum brazing is a high temperature, flux-free brazing process that results in a contamination-free joint. SilcoTek recommends vacuum brazing services from Solar Atmospheres Inc. Your parts are precision cleaned by SilcoTek prior to processing. Additional pre-cleaning by the customer is often unnecessary and at times can be detrimental to our coating process. Can SilcoTek coat fritted liners? SPECIAL NOTE: Coating of glass fritted liners - SilcoTek would prefer that all glass liners be sent without deactivation (e.g. silanization) since the deactivation layer will prevent our intermolecular coatings from bonding to the surface. For most glass liners, our cleaning process will remove all prior deactivants. However, SilcoTek cannot put fritted liners through our cleaning process without damaging the frit. Fritted liners are special because there is no effective way of cleaning glass frits or stripping the coating in case of failure. As we continue to gain experience with glass frits and tailor our processes, we will get better. Our major hurdle is being able to "test" fritted liners prior to coating to ensure they are clean. We continue to work on this aspect of our operation. Are SilcoTek's coatings RoHS and REACH compliant? What about their SDS sheets? Visit http://www.silcotek.com/compliance-statements to learn more about how our coatings are non-hazardous and in compliance with the law. The treatments do not require SDS sheets. SilcoTek coatings conform to the microstructure of the part surface. There is minimal filling of voids or change to the overall surface roughness. Overall roughness measurement may be reduced slightly (1-2 RA reduction), but not a significant change in roughness. Some SilcoTek coatings have a higher lubricity than stainless steel, so even though surface roughness has not changed, the surface may have a lower friction coefficient. SilcoTek® coatings do not have a definitive shelf life. However, since every application is different, including chemical exposure, concentration, temperature, etc., there are potential factors associated with longevity of our coatings. Therefore, we cannot provide a realistic estimation of coating lifetime. If you are interested in determining exactly how long our coatings can last, we recommend testing coated samples and/or a low quantity of your own parts directly in the application. We can support your testing efforts by helping you gather relevant test data, providing free samples, coating your test pieces, and putting our technical experts on your project to find a solution that works. Please contact us to discuss your application and, if necessary, establish a testing and validation plan. Yes! Our unique chemical vapor deposition process is performed in the gas phase, so even the smallest channels and tightest tolerances will be adequately coated along with the rest of the part. We also have the ability to coat certain tube configurations internally-only. 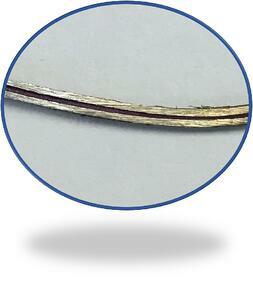 We proved this by coating a 1/16" OD, .4mm ID tube with multiple bends both internally and externally. After coating, the tube was cut open to examine the coating at the center-most point inside the tube. In addition to the external coating on the tube, a quick visual inspection shows the vibrant purple-colored SilcoTek coating inside the narrow bore. The thickness of the coating throughout the tube was verified by a Filmetrics F40-Series Thin Film Analyzer and it was confirmed to meet our specifications. SilcoTek coatings are not applied with line-of-sight processes that lead to inconsistent deposition and uncoated areas. With our process, 100% of your parts are coated, even if the design is complex or the pathways or tortuous. What is the maximum length of tubing you can coat? What are my options for coating tubing? Maximum coil OD for tubing > 1/16" OD: 36"
Maximum coil OD for tubing 1/16" OD or smaller: 18"
Must be shipped on a metal spool or bound with metal wire. No spools made of wood, plastic, or other flammable materials. SilcoTek’s chemical vapor deposition (CVD) process produces coatings that are deemed “high purity” in most applications, including chromatography, medical diagnostics, and more. However, the single byproduct of our silicon coating process is silicon particles (dust), which may be unacceptable in certain ultra-high purity applications e.g. semiconductor. Despite the use of best practices aimed to remove silicon particles after the coating process or to prevent them from forming in the first place, we suggest that customers who use their SilcoTek-coated parts in ultra-high purity applications conduct particulate testing to determine if the coated parts meet their specific cleanliness requirements. If they do not, please contact us so we can assist in finding a 3rd party cleaning vendor who can provide a cleanroom-grade final coated product. SilcoTek’s coating processes deposit materials that are both semi-conductive and dielectric in nature, but they are typically too thin (<2µm) to change electrical conductivity properties. You should evaluate your coated parts or sample coupons on a trial basis first to determine potential impact. For more information on the electrical property characterization of SilcoTek coatings, see this whitepaper.